So you're shuffling round a run-down antique market lane in Saigon, and come across a knee high stack of records, thick with dust. 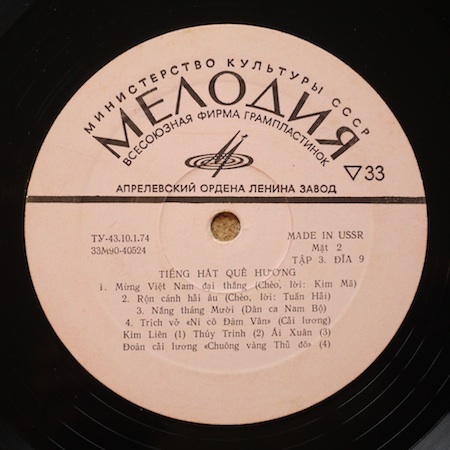 Most of them are Chinese musicals by the covers and best avoided, but some of them look more interesting and are clearly marked 'Vietnam', with some more on the familiar Melodiya (МЕЛОДИЯ) label. The problem is, you've got half an hour before leaving for the airport, and there's no way to listen. What to do? Grab a handful, attempt to feign disinterest, but you struggle to hide your haste and end up paying far more than you should. Get home eventually, and wash them in the sink. Try to suppress the excitement of how you've just got one over Andy Votel. Put the record on. possession, here's one .. and another handful following for good measure (whether you or I like it or not). This record has more folksongs with modern arrangements. This record is better than the previous ones. But it is not authentically traditional. Record was published in Moscow in 1974. Here's some background too, which is unusual for Mrs Blucher, but she was curious. Quan ho refers to the traditional music style. 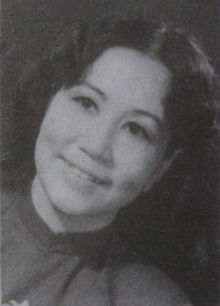 Kiều Hưng (born 1937), is a Vietnamese singer of Vietnamese revolutionary songs. She was born in Hanoi. From 1968 to 1972 Hưng studied at the Kiev Conservatory then again at the Moscow Conservatory in 1991. 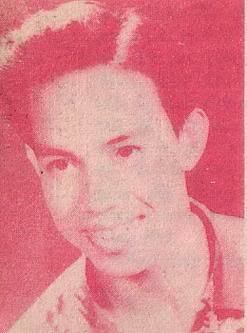 Vân Khánh (Quảng Trị, 1 January 1978) is a Vietnamese traditional and folk singer. She began as a child artist with a family troupe at the age of 12. Her albums have helped to popularize Central Vietnam's folk music with urban audiences in Ho Chi Minh City." 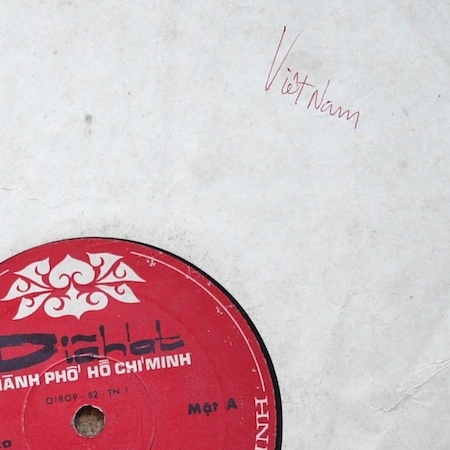 Vietnamese music has had a rather long history. Since ancient times, the Vietnamese have had a strong inclination for music. Music is considered to be an essential need; therefore, numerous musical instruments and genres intended for various purposes have been developed. Vietnamese people use music to express their innermost feelings, to encourage themselves while working and fighting, to educate their children in good traditions and national sentiment, to communicate with the invisible, and to sublimate their aspirations for a happy life. The music of Vietnam and its history are too complex to be described briefly. 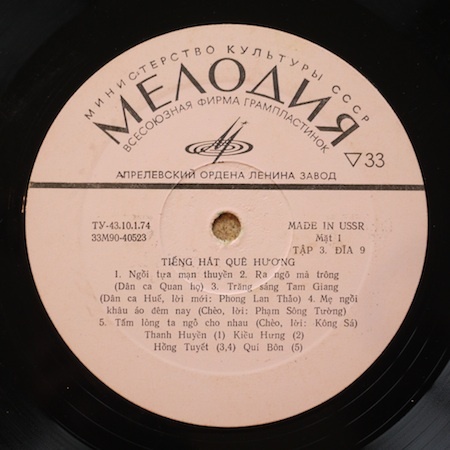 True, to a large extent, Vietnamese music was handed down from one generation to another. I am spending my life studying music of every corner of the country, and am fortunate, however, in having some various written and oral sources on my research. It is hoped that the present information will prove both informative and entertaining to those who have been attracted to Vietnamese music. Tieng Hat Que Huong was founded in 1981 by Pham Thuy Hoan. Our mission is to preserve, develop and nd also building a bridge between the old and the new artists. One and the same, perhaps?